Are new highways necessary? There are better, more affordable solutions. Corridor K is a system of highway between Dillsboro, North Carolina, and I-75 in Bradley County, Tennessee. While most of this corridor is currently four-lane freeway or expressway, two segments remain “incomplete,” running at only two lanes. These two-lane portions serve as scenic highways, attracting tourists, new residents, and small businesses to the region. 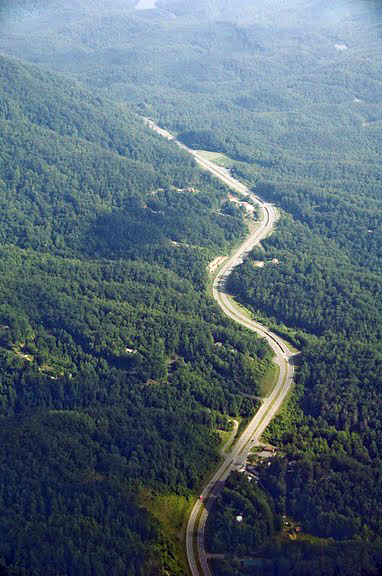 The right improvements to these stretches could even further advance economic development, strengthening the existing network of scenic drives including the Cherohala Skyway and the Tail of the Dragon. Read more about the potential impact of Corridor K on Goforth Creek. In Graham, County, North Carolina, the North Carolina Department of Transportation proposes to widen and relocate existing two-lane highways. In the Ocoee Gorge region, the Tennessee Department of Transportation is considering multiple options to improve or relocate existing U.S. Highway 64, either on a two-lane or four-lane footprint. At WaysSouth, we see that improvements to address the handful of bottlenecks and, where needed, additional passing lanes through Ocoee Gorge would allow both recreational and through traffic to move safely. Further, such a solution would be more cost-effective than spending billions on a new and highly intrusive road. Read about WaysSouth’s efforts concerning Corridor K in North Carolina. Read about WaysSouth’s efforts concerning Corridor K in Tennessee. View the Corridor K photo gallery. Please also visit the Newsroom pages for Corridor K action alerts, media releases, and news coverage.